The following specifications and diagrams were provided by Brian Engelke and John Governo. Draft (bd up): 3' 6"
Draft (bd dn): 8' 0"
Sail Area: 476 sq. ft.
"The C-33 was a fast and comfortable boat from Wirth Monroe who had designed and raced Commanche in the SORC. The boat was a direct descendent of Commanche but Wirth didn't have an eye for looks and we all called the C-33 the "Guanno" boat cause it looked like ----.! (Mike, a C-33 owner notes: they still had the nerve to market it as a "flagship" in the brochures). So after about fifty boats we decided to see if we could make a change. So we took a C-40 deck we had laying around and set it on a C-33 and it pretty much fit, and looked much better, so we took a saw and trimmed off all the overhangs and that's how the C-34 was born." 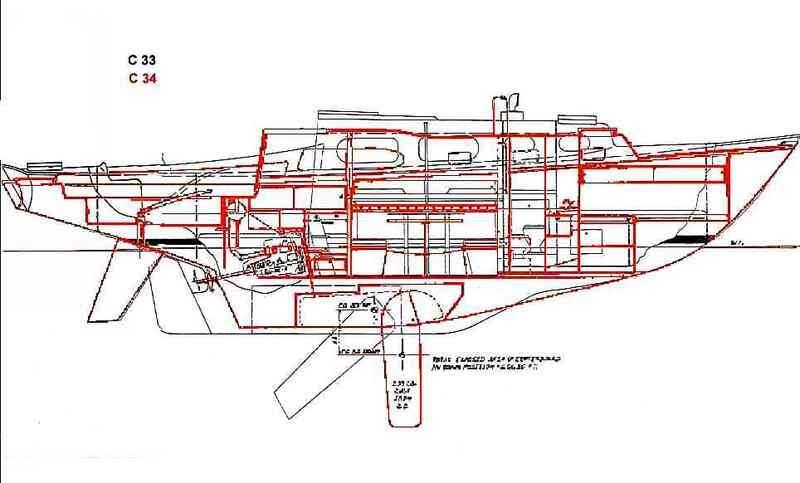 Here are the C-33 and C-34 diagrams overlaid. Please note that these are scans from brochures and not engineering drawings. The new Columbia 34 was designed to give spacious living for 6 at minimum cost. With a C.C.A. rating of approximately 23.0, she handles herself well in light as well as heavy air. 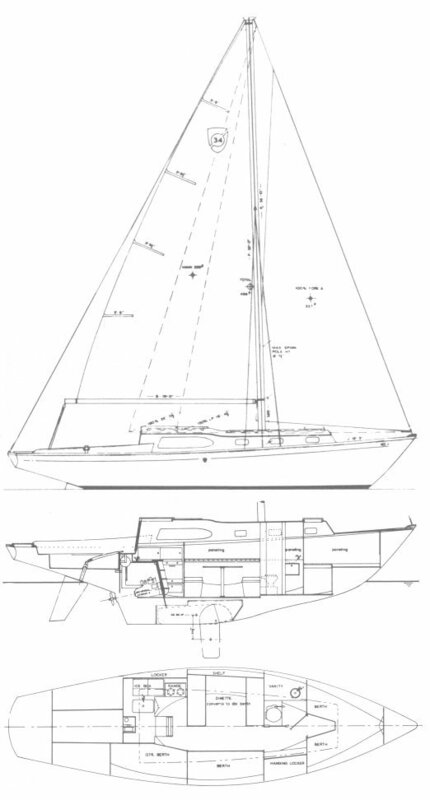 Designed as a keel centerboarder, she can easily tackle the shallow draft cruising areas. The new spade rudder concept gives complete control under trying spinaker conditions while allowing use of minimum hull surface below the waterline. Her interior finish has the look of a large custom wooden yacht. Auxiliary power is a Universal Atomic 4. Available in sloop or yawl. Literature available from Justin Thompson.